If you haven't been following The Affair you can catch up here, here and here. In the bowl of a stand mixer, cream butter and sugar until light and fluffy. Add eggs, one at a time, beating well after each addition. Add in vanilla. In a separate bowl, whisk together the flour, cocoa, baking soda and salt. In another bowl, stir together buttermilk and coffee. Add dry ingredients to creamed butter mixture alternating with buttermilk and coffee mixture, beating well after each addition. Line baking pans with about 24 paper baking cups, and fill each two-thirds full with batter. Bake at 375° for 15-20 minutes or until a toothpick inserted near the center comes out clean. Cool for 10 minutes before removing from pans to wire racks to cool completely. 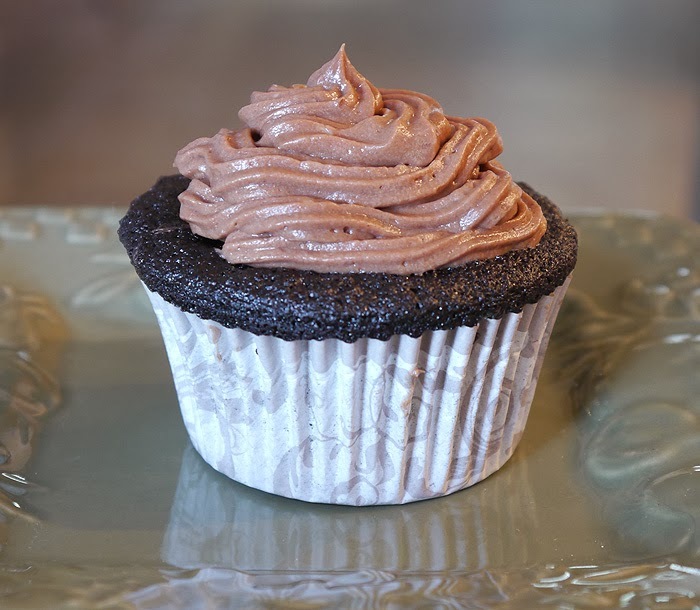 Once the cupcakes have reached room temperature, use a melon baller (or a grapefruit spoon) to scoop out a small portion from the middle of the cupcake (about 1 teaspoon). Fill the empty space with a teaspoon or so of Nutella. Put removed cake back in place and frost cupcakes. Cream together butter confectioner’s sugar. Add Nutella and vanilla and beat on high for about 20 seconds to lighten the frosting. This is what I should bake for my class. They would be thrilled. This is a win, win, win. Just delicious looking. Well said! I mean, I think we'd all say it after one bite. You can't beat Nutella! These cupcakes look delicious! I'm in the midst of a sweet craving - Wishing I could reach in and grab one at the moment!